It is rare these days to find a traditional barber shop practising old skills such as neck shaving, face shaving and razor cutting, but while the cut-throat razor may be largely a thing of the past another old tradition is very much alive. The barber pole can still be seen in high streets the length and breadth of the United Kingdom, with even the most contemporary men’s grooming salons sporting the candy-cane striped pole in one form or another. The barber pole relates not to the art of cutting hair, as one might expect, but to the more gruesome act of bloodletting. It was in the Dark Ages, when most people were illiterate and the physicians were priests and monks, that bloodletting flourished. Barbers were appointed assistants to these religious physicians, but later, in 1163, the clergy were banned from medical practices and it was declared sacrilegious for ministers to draw blood from the human body. This left razor-wielding barbers to continue the bloodletting tradition. When visiting these ancient barber shops, customers (or patients) would be asked to take a tight grip of a rod or staff so that their veins would show. The barber would then cut open the customer’s arm and bleed them until they fainted. Later, leech therapy became popular because it allowed for more controlled bleeding and leeches were applied to the veins. Once the treatment was finished, the barber would wash the bloody bandages and hang them on a pole outside to dry. The long strips of bandages would flap in the wind and spiral around the pole, advertising the services on offer in the barber shop. With the bloody bandages wrapped around it, the pole now resembled the barber pole so familiar today. An early barber pole would be a simple wooden post with a brass leech basin on top. Later, the leech basin was replaced by a ball and the pole with bloody bandages wrapped around it was replaced by a painted pole with red and white spirals. These poles then became permanent fixtures outside barber shops. Barbers and surgeons had separate guilds until the two were merged by Henry VIII in 1540 under the name of United Barber-Surgeons Company. This marked the beginning of some control of the qualifications of those who performed operations, although barbers and surgeons were still set apart. Barbers had to display a blue and white pole and were not allowed to carry out surgery except for bloodletting and teeth-pulling, while surgeons had to display red and white-striped poles and were forbidden from shaving people or cutting their hair. It was only in 1745 that George II passed several acts to separate surgeons from barbers. 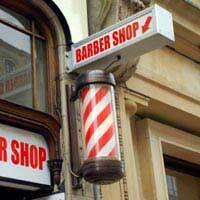 Many of today’s barbers use the combination of blue, white and red-striped poles as an emblem of their profession and there are several interpretations of why these colours are used. One is that the spiral pattern represents a white bandage wrapped around a bloody arm. Another is that red represents blood and white bandages. A third view is that blue represented venous blood and red stood for arterial blood, with white for the bandages. The bowl represented the basin of leeches or the blood-collection bowl.